This in-depth file gives a brief overview of some of the initiatives, partnerships and researches launched by the Arab League beginning with the 21st century, in the field of human rights, peace, and the promotion of other human-rights related fields such as culture, education, development. For what regards the legal framework that the Arab League initiated, the Arab Charter on Human Rights is the major achievement. The Charter was approved by the Arab League Council in 1994, but has not entered into force though, until 2004, when a revised version was approved by the League’s Council and entered into force in 2008. · One of the major peace initiatives issued by the Council of the Arab League regarding the Israeli-Palestinian situation is the Arab Peace Initiative, adopted in March 2002 during the 14th ordinary Arab Summit held in Beirut, Lebanon. The Initiative calls for “full Israeli withdrawal from all Arab territories occupied since June 1967, in implementation of Security Council Resolution 242 and 338, reaffirmed by the Madrid Conference of 1991 and the land-for-peace principle, and for Israel’s acceptance of an Independent Palestinian State with East Jerusalem as its capital, in return for the establishment of normal relations in the context of a comprehensive peace with Israel”. The Initiative was re-launched during the Riyadh Summit in 2007, and Arab League called on Israeli in various meetings to endorse it. · Still with regard to the situation in Palestine, in February 2009 the Secretary General of the Arab League, Amr Moussa, has established the Independent Fact Finding Committee on Gaza with the “tasks of investigating and reporting on violations of human rights law and international humanitarian law during the Israeli military offensive (called also operation Cast Lead) against Gaza from 27 December 2008 to 18 January 2009 and collecting information on the responsibility for the commission of international crimes during the operation” The report of the Independent Fact Finding Committee on Gaza is called “No Safe Place” and was presented to the Arab League on 30 April 2009. It is worth mentioning that also the Human Rights Council established on 3 April 2009 the United Nations Fact Finding Mission on the Gaza Conflict “with the mandate to investigate all violations of international human rights law and international humanitarian law that might have been committed at any time in the context of the military operations that were conducted in the Gaza during the period from 27 December 2008 and 18 January 2009, whether before, during or after”. · Also for the relatively new developments in Syria, Arab League was actively implicated. In 2011 the Arab League began to hold meetings for discussing the situation in Syria creating also an Arab Ministers Commission for Syria (also called Arab Ministerial Committee Concerned with the Situation in Syria). The Commission held several meetings with Syria and presented an Arab Action Plan in October 2011 which was signed at the end of the month by the Syrian delegation. The Action Plan agreed among other, to stop all acts of violence committed by any side in order to protect Syrian citizens, to release all detainees arrested from the beginning of the crisis, and to guarantee the free movement of Arab League affiliated organizations or Arab and international media outlets to monitor the situation on the ground. On 12 November 2011 the Arab League suspended the membership of Syria and proposed an Arab League Monitors Protocol. Syria signs the Protocol on 19 December 2011. The Protocol provided for the “establishment and deployment to the Syrian Arab Republic of a Mission comprising civilians and military experts from Arab countries and Arab non-governmental human rights institutions”. Paragraph 5 of the Protocol established that the Mission (headed by Mohammed Ahmed Mustafa al-Dabi) should transmit regular reports on the results of its work to the Council of the League. (Mission composition: 166 monitors from 13 Arab countries and 6 Arab organizations). In January 2012 Arab League issued the Arab League Initiative for Syria which calls for the formation of a unity government, to be followed by supervised parliamentary and presidential elections, a transfer of power to the Vice President for the transition period and the extension of the Observers’ mission. The Arab League suspended the Mission at the end of January 2012 and proposed the UN Security Council to adopt a resolution that empowers the Arab League Initiative with implementation powers. The resolution was vetoed by the Russian Federation and China at its hearing (draft resolution submitted by Morocco). · On 17 April 2002 the Secretary-General of the Arab League, Amr Moussa, and the High Commissioner for Human Rights, Mary Robinson, signed a Memorandum of Intent outlining cooperative endeavours between the two secretariats in the field of human rights. The Memorandum continues the cooperation and the regular dialogue existing between the OHCHR and the Arab League on specific human rights issues in the Arab countries. The Memorandum provided a framework for further cooperation aimed at enhancing a technical assistance collaboration in the field of human rights as preparing joint meeting and seminars, training of Arab League staff, exchange of information. · The League of Arab States and the United Nations appointed in February 2012, the former Secretary-General of the United Nations, Kofi Annan, as the Joint Special Envoy for Syria. The adopted peace plan for Syria contains a six points proposal designated to seek for a peaceful solution to the situation in the country. 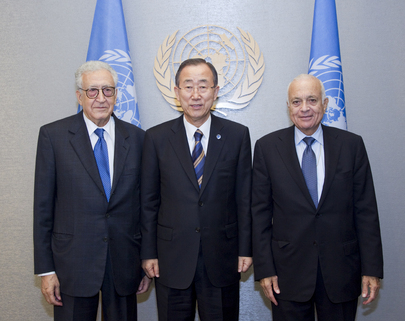 In August 2012 Lakhdar Brahimi was appointed as UN-Arab League Joint Special Representative for Syria and replaced the Joint Special Envoy Kofi Annan. · In 2012 the Secretariat General of the Arab League in collaboration with the Arab Women Organization and the United Nations for Gender Equality and the Empowerment of Women has issued the regional strategy: “Protection of Arab Women: Peace and Security”. The Strategy, as stated in the preface, “aims at achieving peace and security for women. It is based on legal frameworks and mechanisms on both Arab and international levels, and serves as a reference to develop programs and plans to suit the priorities for achieving the human security of Arab women”; practically one of the objectives of the strategy is to work at “integrating the principles of human rights and the values of equality, justice and gender approach into policies, programs and projects”. · Starting with 2000, besides the Arab Parliament, the Arab Peace and Security Council, the Arab Human Rights Committee, Arab League planned the establishment of an Arab Court on Human Rights. In September 2012 the Secretary General of the Arab League, Nabil El Arabi welcomed the proposal coming from Bahrain, and confirmed the support for the establishment of the Court within the framework of the League. The Arab Court of Human Rights would be based on the provisions expresses by the Arab Charter on Human Rights. Another conference for the establishment of the Court was held in Manama (Bahrain) from 25 to 26 February 2013.